We are feeling fortunate this year as we report from our snug dwelling along the Pacific Coast of California, tucked under a weather vortex caused by the cool ocean westerly breezes and nightly fogs that keep vegetation green and lush. But all around us folks are feeling the extreme heat of our warming planet and the ultra-dry forests are burning. The weather reports from around the world last week were extremely frightening. In Phoenix, Arizona, a place where we lived for a brief time, the temperature hit 120 degrees. Phoenix was a hot place when we were there 20 years ago. When the thermometer registered 95 degrees we remained indoors by our air conditioners. The European settlers who came there foolishly dammed up the Salt River to make a lake and tossed black topsoil over that dry desert sand to plant grass. Consequently the heat in Phoenix is very humid and unbearable. Folks there are roasting at 120 degrees. Asphalt melts under your feet. Wildfire was raging in the rural suburban areas throughout Southern and Central California and New Mexico. The extreme heat, dry brush and trees, and summer winds fanned super fires that were forcing people to flee their homes. The firefighters were working in that heat against fires that appeared impossible to stop. At least three people died while attempting to escape a fast moving blaze near Bakersfield, California and more than a thousand homes burned. The massive blaze at Fort McMurray, Alberta, Canada was still burning and had covered 1,632 square miles, coming within three miles of the Saskatchewan border. An untold number of people have been evacuated from the fires and their homes are going up in flames. Deadly thunderstorms and extremely heavy rain that swept West Virgnia left at least 24 people dead. Roads were turned into rivers and homes and cars were swallowed up and swept away in the flooding. In India, violent monsoon rains which appear to be ending a two-year drought have brought intense lightning storms that killed an estimated 90 people in four Indian states. A record number of 57 people died in the state of Bihar alone. So much rain has fallen that the streets of many towns are flooded. 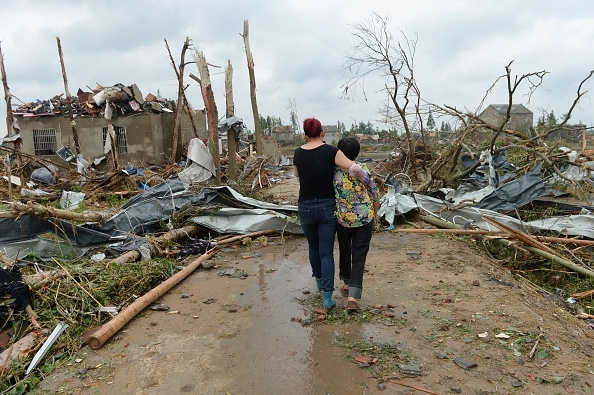 In China a powerful tornado and hailstorm struck the heavily populated area of farms and factories near Yancheng, leaving 78 people dead and 500 more injured. Heavy rains flooded the area and roads were blocked with trees, downed power lines and other debris. A national emergency has been declared. Tornadoes are not as common in China as they are in the United States. The National Oceanic and Atmospheric Administration announced that carbon dioxide levels in the Antarctic have now reached 400 parts per million, the highest it has been in 4 million years. Carbon dioxide, one of several heat-trapping gasses, is considered a primary driver of global warming (or weather change as some would prefer). CO2 levels have been rising all over the world, as can be attested by the fast changes in extreme weather. If we don’t stop burning carbon fuels, the problem is going to intensify. Humanity may not survive what is coming next. Many researchers fear it may already be too late to stop what is happening. Global warming should be the hot political issue among U.S. presidential candidates this year. The only one talking about it is Bernie Sanders, and political forces are doing their best to make sure he doesn’t get nominated.